The G20 summit in Brisbane has been closed by Australia’s PM Tony Abbott who detailed economic pledges agreed by world leaders. 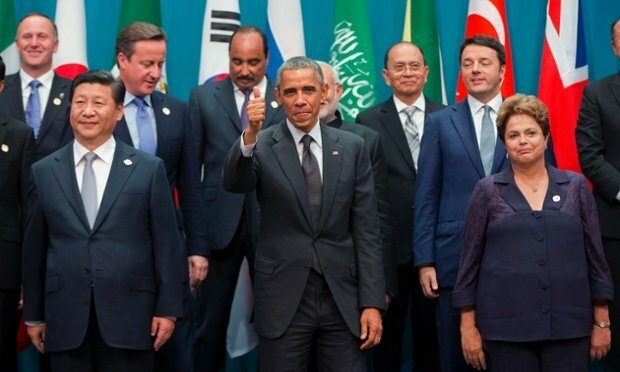 The leaders agreed to boost their economies by at least 2.1% by 2018, adding $2 trillion to global economies. Much of the summit focused on Russian President Vladimir Putin’s position on the crisis in Ukraine. Vladimir Putin faced fierce criticism and left the meeting before it ended, but said the summit was “constructive”. He said he was leaving before the release of the official communiqué, citing the long flight to home to Russia and the need for sleep. Australia, as host of the meeting, had sought to keep the focus on economic issues, but the issues of climate change and the conflict in Ukraine attracted significant attention. President Barack Obama met European leaders on November 16 to discuss a co-ordinated response to what they see as Russia’s destabilization of Ukraine. Barack Obama told reporters Vladimir Putin was “violating international law, providing heavy arms to the separatists in Ukraine” and violating the Minsk agreement. He said the “economic isolation” of Russia would continue unless Vladimir Putin changed course. In a television interview on November 15, Vladimir Putin called for an end to sanctions against Russia, saying they harmed the world economy as well as Russia. The Kremlin denies sending military forces or heavy weapons to pro-Russia rebels in eastern Ukraine. During the summit, Canadian PM Stephen Harper and British PM David Cameron also sharply criticized Vladimir Putin. World leaders agreed to plans drawn up by finance ministers from G20 countries in February, known as the Brisbane Action Plan, to boost their collective GDP growth by at least 2%. The statement also agreed to take strong, effective action on climate change, following pressure from the US and European leaders. G20 leaders also released a statement in which they vowed to do all they could to “extinguish” the Ebola outbreak in West Africa.